Start using Symfony in 10 minutes! This chapter will walk you through the most important concepts behind Symfony and explain how you can get started quickly by showing you a simple project in action. If you've used a web framework before, you should feel right at home with Symfony. If not, welcome to a whole new way of developing web applications. Before continuing reading this chapter, make sure to have installed both PHP and Symfony as explained in the Installing & Setting up the Symfony Framework article. One of the main goals of a framework is to keep your code organized and to allow your application to evolve easily over time by avoiding the mixing of database calls, HTML tags and other PHP code in the same script. To achieve this goal with Symfony, you'll first need to learn a few fundamental concepts. When developing a Symfony application, your responsibility as a developer is to write the code that maps the user's request (e.g. http://localhost:8000/) to the resource associated with it (the Homepage HTML page). The code to execute is defined as methods of PHP classes. The methods are called actions and the classes controllers, but in practice most developers use controllers to refer to both of them. The mapping between user's requests and that code is defined via the routing configuration. And the contents displayed in the browser are usually rendered using templates. When you go to http://localhost:8000/app/example, Symfony will execute the controller in src/AppBundle/Controller/DefaultController.php and render the app/Resources/views/default/index.html.twig template. In the following sections you'll learn in detail the inner workings of Symfony controllers, routes and templates. In Symfony applications, controllers are usually PHP classes whose names are suffixed with the Controller word. In this example, the controller is called Default and the PHP class is called DefaultController. The methods defined in a controller are called actions, they are usually associated with one URL of the application and their names are suffixed with Action. In this example, the Default controller has only one action called index and defined in the indexAction() method. Actions are usually very short - around 10-15 lines of code - because they just call other parts of the application to get or generate the needed information and then they render a template to show the results to the user. In this example, the index action is practically empty because it doesn't need to call any other method. 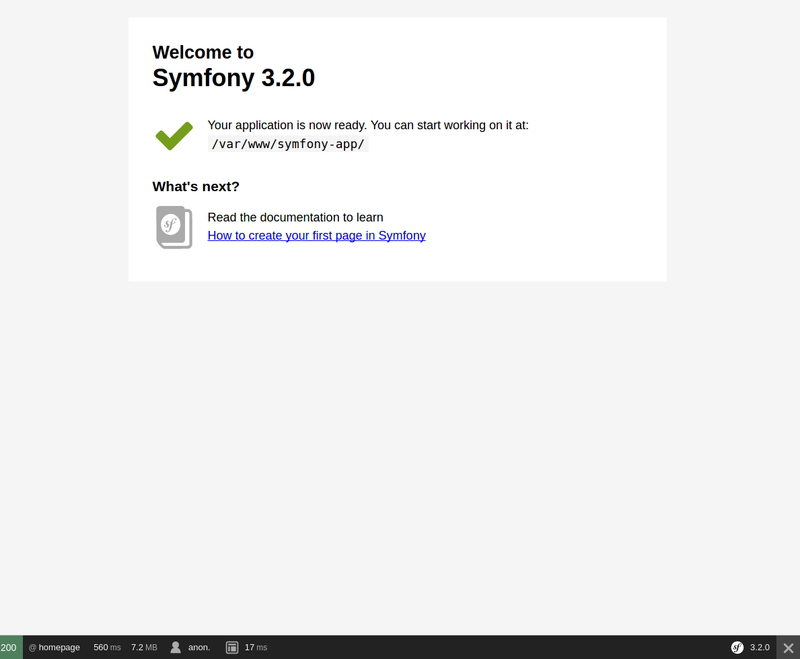 The action just renders a template to welcome you to Symfony. These three lines define the routing configuration via the @Route() annotation. A PHP annotation is a convenient way to configure a method without having to write regular PHP code. Beware that annotation blocks start with /**, whereas regular PHP comments start with /*. The first value of @Route() defines the URL that will trigger the execution of the action. As you don't have to add the host of your application to the URL (e.g. http://example.com), these URLs are always relative and they are usually called paths. In this case, the / path refers to the application homepage. The second value of @Route() (e.g. name="homepage") is optional and sets the name of this route. For now this name is not needed, but later it'll be useful for linking pages. Considering all this, the @Route("/", name="homepage") annotation creates a new route called homepage which makes Symfony execute the index action of the Default controller when the user browses the / path of the application. In addition to PHP annotations, routes can be configured in YAML, XML or PHP files, as explained in the Routing guide. This flexibility is one of the main features of Symfony, a framework that never imposes a particular configuration format on you. The $this->render() method is a convenient shortcut to render a template. Symfony provides some useful shortcuts to any controller extending from the base Symfony Controller class. 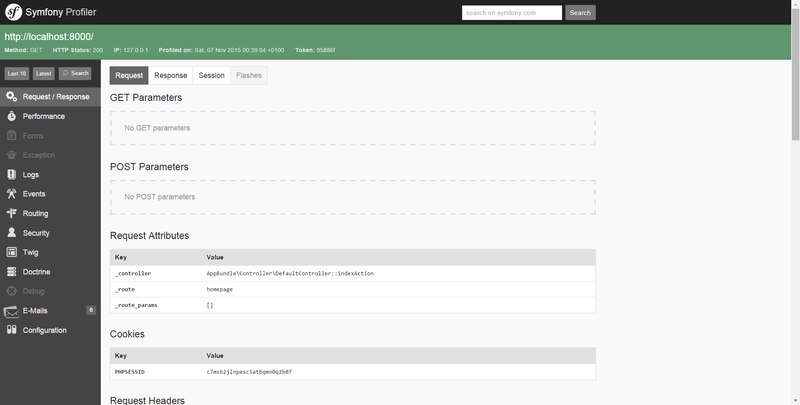 This template is created with Twig, a template engine created for modern PHP applications. The second part of this tutorial explains how templates work in Symfony. Now that you have a better understanding of how Symfony works, take a closer look at the bottom of any Symfony rendered page. You should notice a small bar with the Symfony logo. This is the "web debug toolbar" and it is a Symfony developer's best friend! This tool provides so much internal information about your application that you may be worried about your visitors accessing sensible information. Symfony is aware of this issue and for that reason, it won't display this bar when your application is running in the production server. How does Symfony know whether your application is running locally or on a production server? Keep reading to discover the concept of execution environments. An environment represents a group of configurations that's used to run your application. Symfony defines two environments by default: dev (suited for when developing the application locally) and prod (optimized for when executing the application on production). When you visit the http://localhost:8000 URL in your browser, you're executing your Symfony application in the dev environment. To visit your application in the prod environment, visit the http://localhost:8000/app.php URL instead. If you prefer to always show the dev environment in the URL, you can visit http://localhost:8000/app_dev.php URL. The main difference between environments is that dev is optimized to provide lots of information to the developer, which means worse application performance. Meanwhile, prod is optimized to get the best performance, which means that debug information is disabled, as well as the web debug toolbar. The other difference between environments is the configuration options used to execute the application. When you access the dev environment, Symfony loads the app/config/config_dev.yml configuration file. When you access the prod environment, Symfony loads app/config/config_prod.yml file. In this example, the config_dev.yml configuration file imports the common config.yml file and then overrides any existing web debug toolbar configuration with its own options. For more details on environments, see the "Environments" section of the Configuration guide. Congratulations! You've had your first taste of Symfony code. That wasn't so hard, was it? There's a lot more to explore, but you should already see how Symfony makes it really easy to implement web sites better and faster. If you are eager to learn more about Symfony, dive into the next section: "The View".